There are 15 different KitchenAid stand mixers. Here's how to tell them apart. A good stand mixer is among the most important items in a baker's arsenal. Without a doubt, the most iconic and most popular option around is the venerable KitchenAid stand mixer. First introduced in 1919, the KitchenAid mixer has gone on to become one of the most desirable small appliances around. The reputation is well deserved: KitchenAid mixers are beautifully designed and well-built. With the assistance of a number of accessories, they can even perform any number of additional functions beyond mixing. 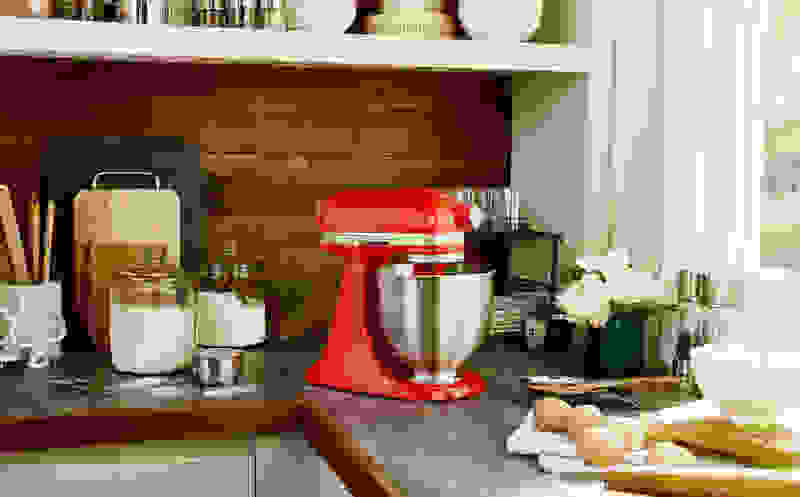 While the KitchenAid brand may be an obvious choice, the choice of exactly which KitchenAid mixer to buy is considerably more difficult. There are currently 15 KitchenAid models to choose from—not to mention over 70 different colors—and all the options can be overwhelming. Well, we’re here to help. We’ve put together this comprehensive guide to help you tell the difference between the various models. But first, we'll tell you which one is our favorite. The KSM150PSER Artisan Series (MSRP $429) is KitchenAid’s most popular tilt-head stand mixer, and we think it’s the best option for the majority of home bakers. The KSM150PSER’s 5-qt. stainless steel mixing bowl can handle enough dough for nine batches of cookies, and the 325W motor should be more than sufficient for frequent use. The KSM150PSER can also handle the occasional heavy bread dough, though we wouldn't recommend it for a professional baker. Every KSM150PSER comes with a coated flat beater and dough hook, both of which are dishwasher safe, as well as a six-wire whip and a pouring shield. The KSM150PSER is also available in over 30 different color combinations, so you can find one that looks great in your kitchen. Like every other KitchenAid stand mixer, the KSM150PSER has a ten speed motor and is compatible with various optional attachments such as food processors and meat grinders. 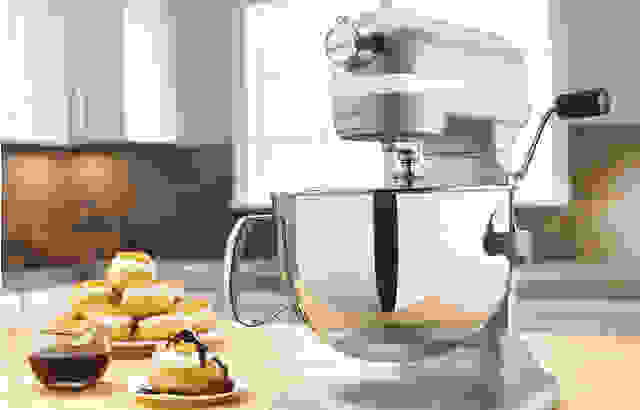 If that doesn't fit your needs, we've detailed the differences among all the other KitchenAid stand mixers on the market Regardless of the model, every KitchenAid mixer comes with a mixing bowl, a flat beater, a dough mixer, and a whip. Every model has a ten speed motor and is compatible with the optional attachments. They're also all made in Greenville, OH. Before you go any further in the buying process, you must make one major choice: Tilt-head or bowl-lift? On tilt-head mixers, the mixer housing is hinged and lifts up so the user can remove the bowl. On bowl-lift models, the head remains stationary, and a lever raises the bowl up to the mixer. 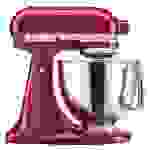 When most people think of KitchenAid mixers, they are probably picturing the popular tilt-head Artisan series. Tilt-head mixers are generally smaller and shorter than bowl-lift models, but do require some overhead space so the head can tilt back. KitchenAid’s tilt-head models are less powerful than their bowl-lift counterparts and often have less capacity due to their smaller mixing bowls. Bowl-lift mixers are taller and heavier than tilt-head models, and require more overhead room. KitchenAid's bowl-lift models are designed for larger batches of cookies, cakes, and breads. For the most part, they have more powerful motors and come with larger mixing bowls. They also come with a spiral dough hook that is slightly more effective at bread mixing than those found on tilt-head models. While it’s tempting to assume that more power and a larger mixing capacity is always preferred, we recommend sticking with the tilt-head models unless you regularly plan to make multiple batches of cookies and cakes in one go. The larger bowl-lift models struggle to effectively incorporate smaller mixes, and are ideally suited to those who bake a lot and often. While every KitchenAid stand mixer comes equipped with a perfectly capable internal motor, it's worth noting that certain models are more powerful than others. The various models available run the gamut from smaller 250W motors all the way up to 1.3-hp behemoths. Stronger motors can handle larger quantities of ingredients, can tackle dry bread doughs, and can be used more often than weaker motors—so keep that in mind when picking your mixer. 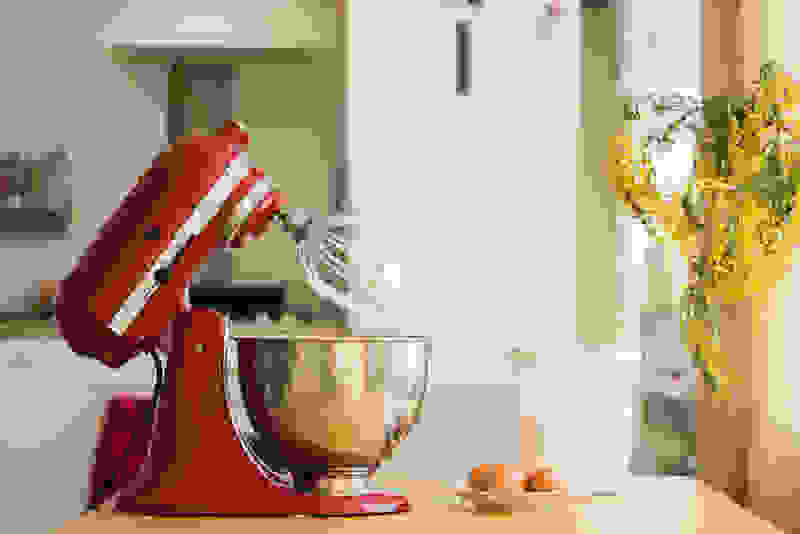 Another term that may crop up in KitchenAid's promotional materials is "touchpoints." It has nothing to do with where the user touches the mixer; rather, it refers to the number of points that the blender attachment will touch in the mixing bowl during operation. The more touchpoints, the less often you'll have to scrape mix or dough off the sides of the bowl. Depending on the model, a KitchenAid mixer will come with either a 3.5-qt., 4-qt., 5-qt., 6-qt., or 7-qt. mixing bowl. Bowl size will determine how many batches of cookies or cakes you can make in one go. Unless you plan on mixing and baking multiple batches of cookies at once, we think a 5-qt. bowl should be more than sufficient. This is the latest entry in the tilt-lift line of Kitchenaid mixers. As the name suggest, the KSM3311XHT Artisan Mini (MSRP $399) is a smaller version of the popular Artisan mixer. KitchenAid says the Mini is about 20% smaller overall than the Artisan, and has a 3.5 QT mixing bowl. It has a 250 Watt motor which is the same as the Classic model. It also has 69 touchpoints. The K45SSWH Classic Series (MSRP $349.99) and KSM75WH Classic Plus (MSRP $349.99) are entry level mixers that have been on sale for many years. Both come with 4.5-qt. handle-free metal mixing bowl, and feature 59 touchpoints. The only difference between the two is down to power output: the Classic has a 250W motor, while the Plus has a 275W motor. On the surface the KSM95GA Ultra Power (MSRP $359.99) and KSM96ER Ultra Power Plus (MSRP $399.99) are identical to the Classic Models. The real difference can be found in the motors. Both models have 300W motors. Additionally, the Power Plus has 67 touchpoints, while the Ultra Power has 59. We’ve already discussed the popular Artisan Series, but similar is the KSM155GBCA Artisan Design Series (MSRP $459.99). The Design series comes with a glass 5-qt. bowl which—unlike the metal version that comes with the KSM150PSER—is microwave safe. The Design series also has burnished mixing attachments, while the Artisan's are white. Both models have 325W motors and 59 touchpoints. Similarly, the KSM152PSNK Custom Metallic Series (MSRP $649.99) is virtually identical to the KSM150PSER, but sports a metallic finish. Finally, the KSM150APSCS Architect Series (MSRP $429.99) is almost identical to the Artisan Series. Aside from color options, the only major difference is in the accessories. The mixing attachments that come with the Architect series are burnished metal, while the Artisan’s are white-coated. The KG25H0XER Professional Heavy Duty Series (MSRP $419.99) is the least-powerful and smallest of the bowl-lift models. Ideally suited for those who want a bowl-lift design but don't need a massive capacity, it has a 475W motor and a 5-qt. mixing bowl. The KP26M1XER Professional 600 Series (MSRP $569.99) has a 575W motor, 67 touchpoints, and a 6-qt. mixing bowl. The KF26M22CA Professional 600 Design Series (MSRP $599.99) is identical to the 600 series, but comes with a glass mixing bowl instead of a metal bowl. The KSM6521XCA Professional 6500 Design Series (MSRP $679.99) has the same 6-qt. glass bowl as the 600 design model, but swaps out the 575 watt motor for a more powerful 1.0-hp version. It has 72 touchpoints. The KSM7586PCA Pro Line (MSRP $699.99) is the largest and most-powerful KitchenAid mixer designed for home use. It has a 1.3-hp motor, 72 touchpoints, and a 7-qt. mixing bowl. A commercial model is also available to consumers, but it's only sold as a certified refurbished model. The KSMC895ER Commercial Series (MSRP $1,030) has a 1.3 HP motor and a 8-qt. mixing bowl with a stainless steel guard. It is also NSF-certified and features a high-efficiency DC motor. However, unless you are baking for a massive family or are thinking of moving into the professional cooking game, you’re probably better off with the smaller models.